"Haus 1", the former seat of the Minister for State Security Erich Mielke and now the seat of the Stasi-Museum houses the permanent exhibition "State Security in the SED-Dictatorship". 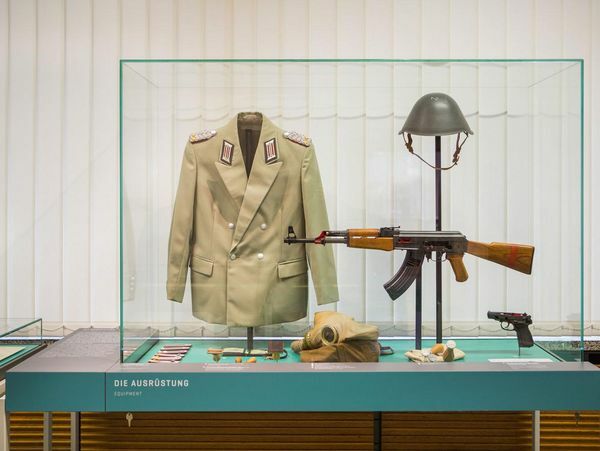 At the historic site it gives an overview over the structure, methods and effects of the Ministry for State Security (MfS), the secret police of the Socialist Unity Party of Germany (SED). The MfS, colloquially known as the Stasi, was charged with securing the power of the SED. Under the one-party rule of the SED from 1949 - 1989 the state was considered the party's property, no other political force ever came into power and the Stasi was charged with safeguarding the iron grip the SED had on the state and its institutions. What turned the Stasi into a secret police was its all-encompassing, largely unchecked power. It acted as an intelligence service, a police force and a prosecutor, organized in a military hierarchy. Its main object of activity were the citizens of East Germany. Through surveillance, persecution, ostracism and force, it persecuted those considered "enemy-negative elements" and with that set examples for the rest of society to comply and adapt to the will of the party. It considered itself "shield and sword of the party" and was a force that permeated the everyday life in East Germany. By educating about the history and methods of the Stasi the exhibition renders obvious why the Stasi became such a central focus during the Peaceful Revolution of 1989/1990 and its disempowerment a central goal for the people. 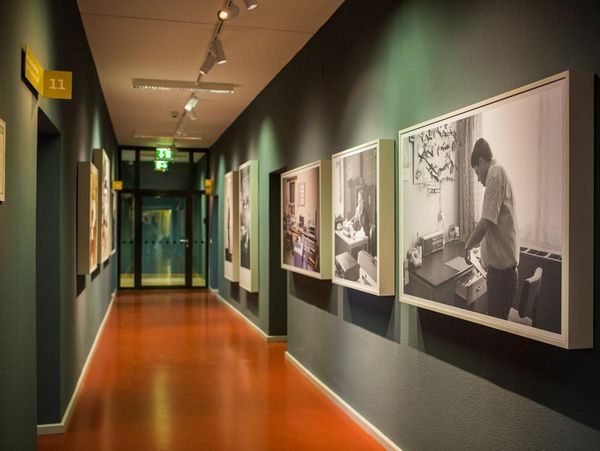 Third floor of the new exhibition "State Security in the SED-Dictatorship" - Photos of Stasi officers at work. 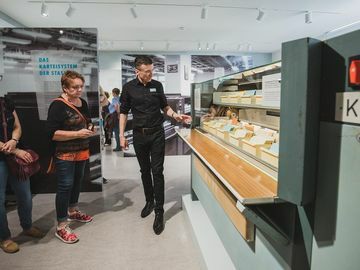 Over three floors the exhibition gives insight into who worked for the Stasi and why they joined, how the everyday task of finding "enemies" amongst one’s own people was carried out and how in specific cases the persecution of such "enemies" was executed. The second floor displays an authentic preservation of the original offices of the Minister for State Security, Erich Mielke, including his private chamber and big conference room. One central means of information gathering for the Stasi was the recruitment and implementation of unofficial collaborators (in German abbreviated as "IM"). The Stasi looked for people of all walks of life in any type of profession or circumstance to be secretly recruited to deliver information about other citizens. 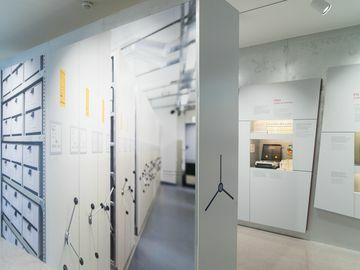 The exhibition explains the broad spectrum of unofficial collaboration and how the Stasi officers skillfully lead their moles to further their goal: the maintenance of power of the SED. Many documents from the Stasi Archives as well as photo and film records illustrate the inner working of the Stasi on the basis their own documentation. Among them educational films of the Stasi, speeches by Stasiminister Erich Mielke or photographs from the everyday life in the Ministry. 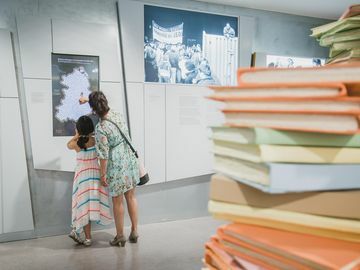 The permanent exhibition was jointly developed by the Federal Commissioner for the Stasi Records (BStU) and the citizens’ assocication ASTAK e.V. who runs the Stasi Museum as a whole. ASTAK e.V.. was founded and till today is run by citizens who occupied the Stasi premises during the Peaceful Revolution on January 15, 1990 as well as former political prisoners of East Germany. The MfS had up to 91.000 official members of staff. Uniform, weapons and a helmet belonged to their equipment.